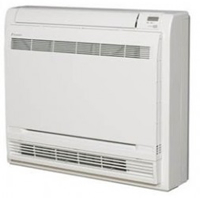 Daikin offer two ranges of Floor Mounted air conditioning units the FVXS Nexmura and FVXS Console Unit. The stylish Nexura range features a unique front panel that radiates heat for extra comfort, with extra low noise levels achieved amounting to barely 22 dB(A) in cooling and 19 dB(A) in radiant heat mode. Complementing this the FVXS unit has a low height of only 600mm fitting under most windows and can also be partially recessed. 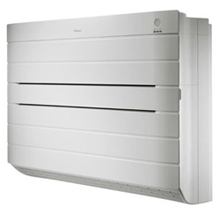 The fan coil unit has a unique feature of floor level heating function to deliver a powerful dual air flow pattern to achieve a uniform and comfortable room. Please contact our Sales Office for selection or application advice or simply to place an order .